What a dork: Erik Hanson was a nerd. He collected model trains, could speak Klingon and ran a weekly Dungeons & Dragons game out of his parents' basement. 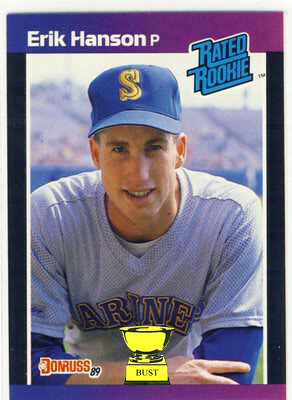 This did not translate well during his rookie season with the Mariners. After challenging teammate Mickey Brantley to a game of Magic, Brantley gave Hanson a series of noogies, a swirly and a wedgie so atomic that Hanson had to remove his own Fruit of the Loom tag from his gall bladder. After weeping for an hour in his locker, a mortified Hanson requested a trade and entered the witness-protection program, changing his name to Craig Counsell. Haha. Doubtful....grew up with Erik. With him it was sports or nuthin'! I was the Star Trek nerd.